I have a 4 GB Micro SDHC card and I use a Micro SD adapter sleeve to read it with the built-in SD card slot of my 15" mid-2010 MacBook Pro. It's been a while since I tried to use it, but I just realized that my Mac will always treat it as read-only, no matter the position of the physical lock on the adapter sleeve. I can't even format the partition because all the options in the "Erase" and "Partition" tabs of Disk Utility are grayed out for the SD card. Why is the card read-only, and more importantly, how can I write to it? In my case, a physical misalignment is causing the read only status. Gently pushing the disk away from the display reliably makes my cards write again. Is this problem for all your SD cards or just one. If just one, I would try formatting it in FAT from a PC and then trying that. I had a USB flash drive that I had installed a Linux distro on and it gave me similar issues on my Mac mini. Locate the following keys on the keyboard: ⌘+Option+P+R. You will need to hold these keys down simultaneously in step 4. Immediately press and hold the ⌘+Option+P+R. You must press this key combination before the gray screen appears. Continue holding the keys down until the computer restarts, and you hear the startup sound for the second time. The problem spontaneously disappeared for me. I'm leaving this as an answer since it might reassure some people to know that for some random reasons, at some point, things start working again. However, I was not able to pin down a specific cause for it, so I'm not going to accept the answer, in case that at some point someone comes with a rational explanation. The tricks above worked for me but less and less so. It feels like a hit and miss and can easily take me 10 tries. I’m actually going to buy a reader because of these disadvantages. I tried all other solutions but it didn't work. My solution was to just push the card in as quick as I could possibly push! Another thing to ensure when trying all these 'tricks' is to plug the laptop into a power supply. Because the card reader draws power if the battery is not delivering enough current to the reader it can cause issues. For example, mounting of problematic USB hard disks can be resolved by plugging the laptop to the power supply. I regularly have this problems with my macs ...so I bought two card readers. One is an Advent one... but that wont let me write sometimes either. The one I have by Puremedia seems to have no problems though .. so I stick with that. 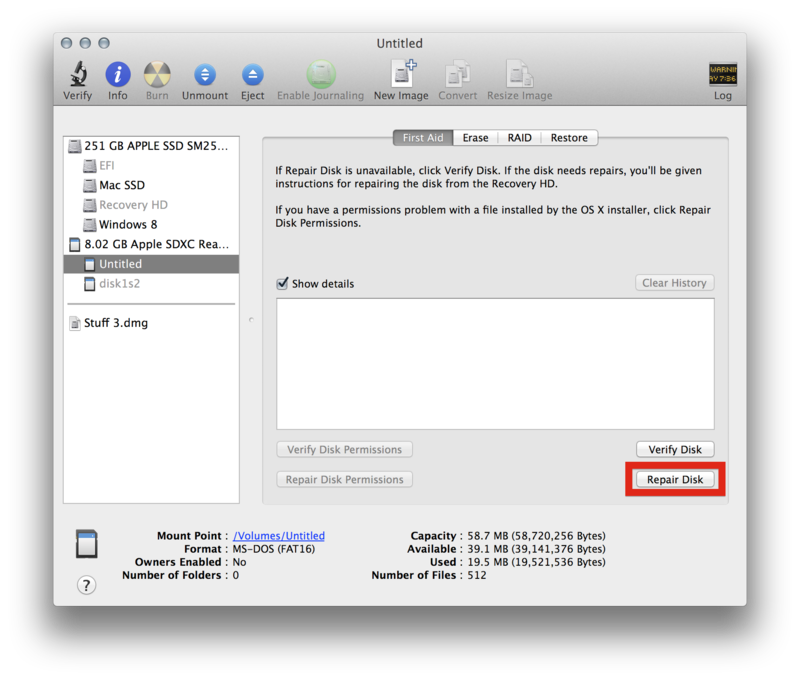 Open Disk Utility, find and select the SD card, then click Repair Disk from the First Aid tab. You should now be able to read and write. Not the answer you're looking for? Browse other questions tagged mountain-lion sd-card . Is it possible to override the SD Card write protection setting in software? How can I make my microSD card writable? Is SDHC Card compatible with a MBP mid-2009? Why is 64GB SD Card “unreadable”? How do I rename a FAT SD Card using a MacBook Air?